Not interested in New Hope ? Please choose a different community. 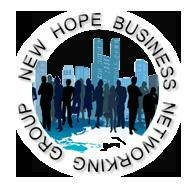 The New Hope Business Networking Group was started by New Hope business owners and is OPEN and FREE to all businesses in the New Hope, Crystal, Plymouth, Robbinsdale & Golden Valley area. This casual group was created to promote involved businesses and work as an open forum for networking within the cities and interact with the City of New Hope. See our offers in the TownPlanner calendar and on our website!